French country style has a rustic appeal that includes natural colors seen in the countryside of France such as red, orange, gold and green, as well as cornflower blue with hints of lavender mixed in. Decorating with French country design pillows can create a relaxing environment, and there are really no rules to follow. Plaids, florals, stripes and toile - mix them all up, and they still work with the overall style of the room. There are several styles and designs for pillows used in French country decorating. 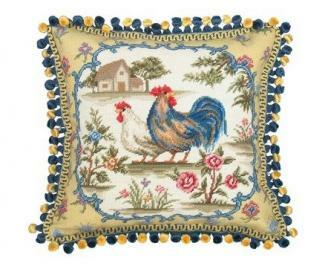 Design tip - Add one or two needlepoint rooster pillows to a kitchen wall shelf featuring dinnerware with roosters. These pillows would also look great on a window seat inside a breakfast nook or placed on chairs around a rustic, farmhouse-style table. Village House - This retailer's designs include roosters, sunflowers, leaves, cows and bunnies on pillows that range from $130-$200. Throw Me a Pillow - These pillows feature motifs similar to Village House at about the same price. Toile pillows are very popular in French country decor. These pillows have an off-white or beige background with a pattern or repeating scene. Although blue is the classic color, toile pillows are seen in red and green as well. The scene or pattern on each pillow is reminiscent of the countryside, just like the needlepoint pillows. Design tip - A single toile pillow placed on a Baroque or French provincial style chair would make an elegant accent. Toile pillows also look great scattered on a wrought iron bed. Country Curtains - Pastoral country scenes are featured on these toile pillows available in three different colors. They are affordably priced at around $30. Zazzle - This site has a nice selection of toile pillows in a variety of colors such as blue, red, pink and burgundy, as well as black and white. Prices start at $49. 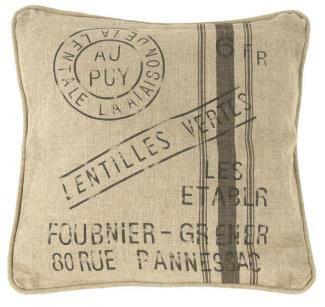 Vintage cloth sacks that held French grain and flour are the inspiration for burlap and grain sack pillows. These rustic-looking pillows may also have additional designs on them, and they add a rich, coarse texture to sofas and chairs. Their neutral color matches practically any type of decor. Design tip - While it's common to see grain sack pillows used on light, slip-covered furniture to create a tone on tone look, try them against darker upholstery for a strong contrast. These pillows also look great against wood furniture and shelving. 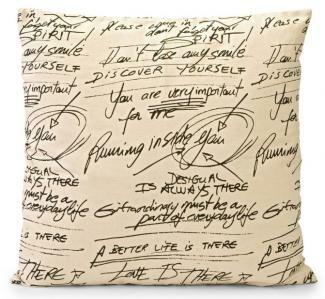 Kathy Kou Home - This shop has a mixture of square and rectangular lumbar pillows with vintage stamps and toile motifs. Prices start around $55. Restoration Hardware - This site has vintage grain sack pillow covers for both square and lumbar pillows. Prices start at $49. Black and white pillows also fit into a modern French country theme. The pillows usually have a black and white design on the front, such as floral or paisley, and then the back is all black. 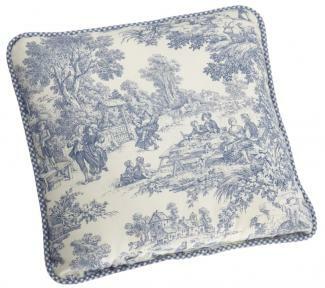 The front of the pillow might also feature a scene from the countryside, just like toile pillows. Design tip - Black and white French country pillows would make a nice accent on a Victorian chase lounge in a boudoir-style bedroom or a black and white themed room. Etsy - This site has a large selection of handmade French country style pillows in a variety of colors and designs, starting as low as $8. Country Villa Decor - Many styles of these pillows are offered here, including black and white patterns in a wide range of prices. You can use French country pillows in a variety of ways to decorate a room. The most basic use is placing them on couches and chairs in the living or family room. 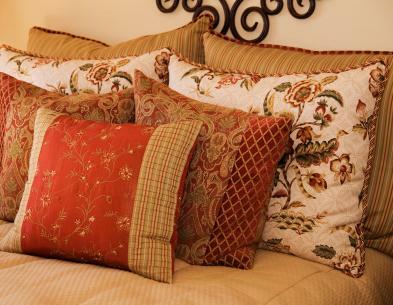 Toss the pillows as decorative items on a bed in the master bedroom or a guest room. When using these pillows in basic places, such as a bed or a couch, select pillows that vary in size and color. This creates a little contrast that is more interesting and visually appealing. Fill a large wicker basket with pillows, and place the basket on the floor in the corner of a room. These pillows also look great sitting on a window bench in a living room or a bedroom. The wood and the design go together perfectly. Use a large pillow as a doorstop for any door in the home. Use large pillows as extra seating on the floor. Store them under a coffee table or in a large basket so they can be a decoration as well. Place small pillows on side tables or on shelves as knick-knack items. Even if your home decor isn't based on a French country theme, these pillows still go well with a casual country-style home or an eclectic-style home. The key to making French country pillows work with a different decorating style is to tie them in to a room with similar colors, textures or patterns.